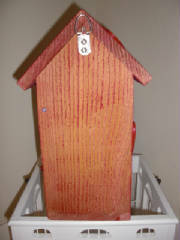 The wood for this birdhouse had perfect texture so I decided to just highlight it with radiant red exterior paint. The red picked up the natural pattern of the wood giving it an antique look. I did not want to plug up the nail holes because it would take away the natural look. 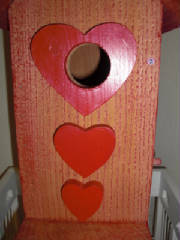 Red wood hearts are added all over so you really fall in love with this birdhouse. 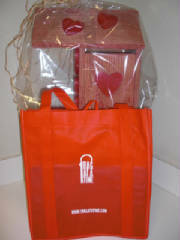 Perfect gift for Valentine or birthday. 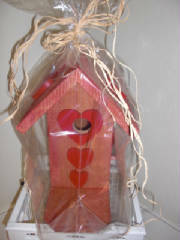 Approximate measurements height 12", width 6", house depth 7", roof & floor 11.5".